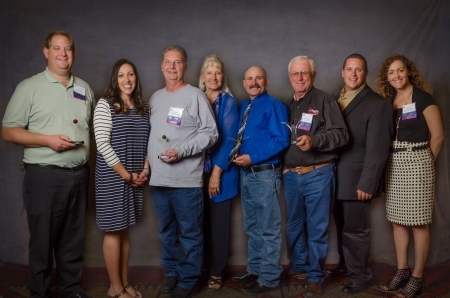 JBH personnel were recognized for their awesomeness during the first annual AGC Best People event held June 15 at Sandia Resort and Casino. Those recognized include; (with trophies- L to R)Taylor Cardon-Project Manager of the Year; Dave Davis- Technical Professional of the Year; James Chapman- Safety Professional of the Year; and Steve Wright- Superintendent of the Year. Also pictured in supporting roles are; (L to R) Melissa Gomez- Corporate Support Manager; Barbara Spitz- Corporate Safety Manager, Aaron Armijo- PM II; Denise Wadkins- HR Manager.